Bungle Bungle Wilderness Lodge is located in the heart of Purnululu National Park and offers access to the famous beehive striped domes of the Bungle Bungle Range, Piccaninny Creek, the natural amphitheatre of Cathedral Gorge and Echidna Chasm. APT Wilderness Lodges offer a touch of luxury in the heart of the wilderness and eliminate the hassles from your self-drive Kimberley adventure. Choose from standard twin tented cabins or Superior cabins with either a king or twin sized beds. Cabins offer a spacious ensuite, hot shower and flushing toilet. A private front deck, is the perfect place to take in the idyllic bush setting of the Lodge. When it comes to accommodation in Purnululu National Park, Bungle Bungle Wilderness Lodge sets a standard all of its own, and is guaranteed to be a highlight of your Kimberley experience. Bungle Bungle Wilderness Lodge is located right in the heart of World Heritage-listed Purnululu National Park. It offers convenient access to the stunning beehive domes of the Bungle Bungle Range, and the breathtaking beauty of Piccaninny Creek, Cathedral Gorge, Echidna Chasm and Mini Palms Gorge. The idyllic bush setting gives you the opportunity to immerse yourself in the tranquil beauty of the National Park. The private ensuited tented cabins are strategically placed to ensure your privacy, whilst still being located close to the main lodge facilities. Soak up the tranquil atmosphere from your private deck, as you observe the abundance of beautiful birdlife. 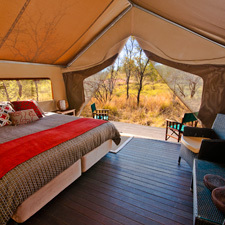 Bungle Bungle Wilderness Lodge features two grades of accommodation, Standard Twin or Superior King or Twin tented cabins. Dining facilities at the lodge feature a retractable roof, offering you the opportunity to dine under the stars. After dinner, relax with new friends around the campfire as you take in the beautiful bush surrounds. We are proud of our leave no trace philosophy, which helps protect this unique World Heritage-listed National Park. Award-Winning Lodge Bungle Bungle Wilderness Lodge was awarded the inaugural New Product Development Award by Australias North West Tourism, an affiliate of Tourism Western Australia. It also received a silver medal in both the Ecotourism and Unique Accommodation categories of the Western Australian Tourism Awards. From the Great Northern Highway, go through a gate, follow the Spring Creek Track, passing the Ranger Station/Visitors Centre (allow at least 2.5 hours to travel this 53km). At the T Junction, turn right toward the airstrip. Follow the road and continue past the airstrip and Piccaninny Creek turnoff. Travel a further 1.2 km, continue straight ahead, passing the Walardi Public Camp Area turnoff. Keep going past the sign - No through Road - Private Camps. Take the first driveway on the left at the “APT Wilderness Lodge” sign. Park in the car park. When it comes to accommodation in Purnululu National Park, Bungle Bungle Wilderness Lodge sets a standard all of its own. The lodges unique accommodation is guaranteed to provide one of the highlights of your holiday. Exclusive to APTs Kimberley Wilderness Adventures, Bungle Bungle Wilderness Lodge is located in the heart of Purnululu National Park. The lodge offers convenient access to the stunning domes of the Bungle Bungle Range, and the breathtaking beauty of Piccaninny Creek, Cathedral Gorge, Echidna Chasm and Mini Palms Gorge. Accommodation at Bungle Bungle Wilderness Lodge is spread across two sites in order to avoid overcrowding and maximise the bush environment experience. The Bellburn site comprises of 30 tented cabins on the banks of the dry Bellburn Creek. Upstream from Bellburn is the Piccaninny Lodge site, which features just ten tented cabins, ensuring an intimate experience. Bungle Bungle Wilderness Lodge has two grades of accommodation - Standard twin and Superior double/twin - are offered at the Bellburn site, while all accommodation at the Piccaninny site is in Superior double/twin. Dining facilities at the lodge feature a retractable roof, offering you the opportunity to dine under the magnificent Kimberley stars. After dinner each night, guests can relax with new friends around the campfire before turning in. This lodge is fully licensed prodviding a limited range of beverages. 3 course gourmet dinner and breakfast included. 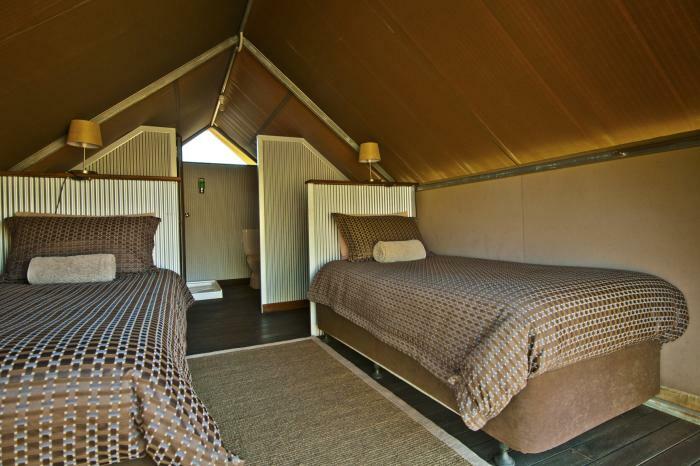 Twin bedded accommodation in a Tented Cabin. Rate includes 3-course dinner and full breakfast daily. Infants under 2 are FOC in existing bedding. Cots are not available. 3 course dinner and breakfast included. Accommodation in Twin or King Tented Cabin. Rate includes 3-course dinner and full breakfast daily. Infants under 2 are FOC in exisiting bedding. Cots are not available on site. This general information relates to Australian Pacific Touring Pty Ltd herein after referred to as The Company. 3. Camps are open between April/May and October. We reserve the right to amend opening and closing dates at any time. Any additional expense incurred by the passenger is not The Companys responsibility. A charge of $70 PP will apply to any addition or modification requested after the original booking has been confirmed. Any day in the World Heritage Purnululu National Park is a great day, so what are you waiting for - Book Now and experiance it for yourself!